Of all the nails that I've done so far, this is one of my most favorites. I only did the one nail though, so if someone wants a full set of these, just let me know! I'd love to see how a whole set looks. These are sculptured gel nails. 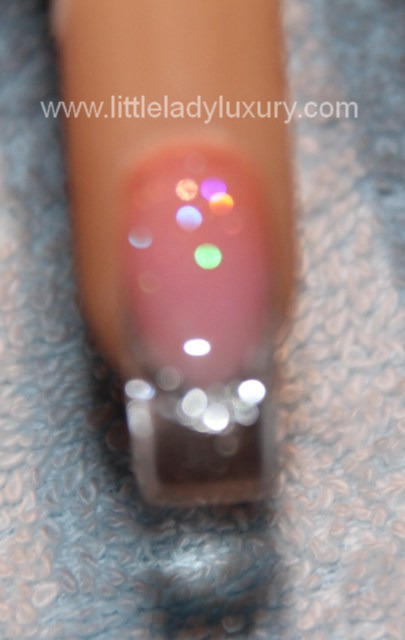 The nail bed is a cosmetic cover pink by Light Elegance with glitter that I hand mixed in. the silver is "Icicles" glitter gel by Light elegance, and of course the clear is Light Elegance also. The last picture is all blurry, but it really shows the glitter :) Sometimes its just so hard to capture how nice nails turn out on camera! As for me, I'm ONE day away from getting off the ship. Thats right. So if you don't here from me for a little bit, its because im having too much fun on land. Well, actually it'll be more like, I'm too busy trying to get me and my boyfriend moved into a new apartment, but you know what i mean. I'll post again as soon as i can!